SBA District Director Yvette T. Collazo. SBA District Director Yvette T. Collazo announced all of this year’s honorees. The Puerto Rico and U.S. Virgin Islands district office of the U.S. Small Business Administration presented the “Small Business Person of the Year Award” to Víctor M. Rivera-Solanas and María Paula Rivera-Solanas, president and vice president, respectively, of Atención Atención Inc.
Atención Atención Inc. is a children’s entertainment and educational company founded in 1999. The business combines games and dance to teach values through the art of music. Its television show has received 36 nominations to the Emmy Award Suncoast Chapter and is the winner of ten statues in various categories. Also nominated to the Latin Grammy Awards, Atención Atención employs 67 people. 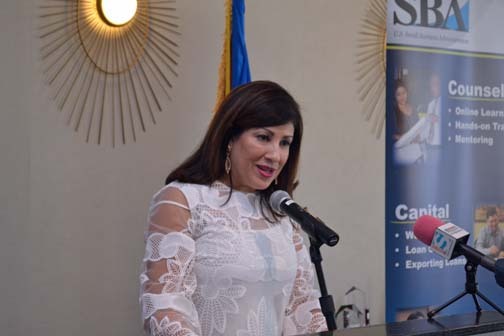 “The contributions Víctor and María Paula have made as small business owners have not only resulted in job creation and their community’s economic expansion,” said SBA District Director Yvette T. Collazo. Established in 2009 doing business as Bientesabe Gourmet, and currently operating as BTS Foods/CUPS, the company offers a full line of dessert products for food industry customers throughout the island. The company serves the retail industry through CUPS, 5-oz desserts prepared and sold in plastic cups with lids; these are available at the factory in Bayamón, or at kiosks in various shopping centers. The business employs 10 people. Carlos N. Castillo Piazza – La Cuisine Catering Service Inc. Established in 1984, the business provides catering services throughout the island for events of between 25 and 3,000 guests. In 2001, Castillo and his wife Olga purchased a property in Trujillo Alto, which they named Jardines del Castillo, and which has become a favorite for weddings and anniversary parties, due to its lush gardens and castle-like structure. The business employs four people full-time and hires additional staff under professional services per event. Established in 2004 by José Gascó, the Gurabo-based company provides manufacturing solutions that help retailers and distributors offer quality products that meet strict regulatory requirements. With a food division that manufactures seasonings and spices, and an industrial division that produces cleaners and disinfectants, Gascó Industrial also produces private labels and employs 23 people. Operating since November 2015, Do the Math is a tutoring and supervised studies center for students in grades sixth through twelfth, and focuses on the following subjects: pre-algebra, algebra, geometric, pre-calculus, and others. The business has created fours jobs. Iris Vincent – Prime Air Corp. Founded in 2001, Prime Air is an Economically Disadvantaged Woman-Owned business dedicated to offering logistics, transportation and warehousing services to the federal government and private sector. Located in Carolina, the company focuses on customized services and employs 22 people. The SBA also bestowed the following awards to participating lenders that during fiscal year 2016 provided over $95.5 million in financing under the agency’s 7(a) Loan Guaranty program: Gold Award to Banco Popular de Puerto Rico; Silver Award to Economic Development Bank for Puerto Rico; and Bronze Award to Banco Santander Puerto Rico; FirstBank de Puerto Rico received the Star Award for delivering the first SBA CAPLine on the island; and “Corporación para el Fomento Empresarial del Comercio y de las Comunidades” (COFECC) received the Certified Development Company of the Year Award. The District Director’s Special Award went to Rafael Contreras, transition services officer of Fort Buchanan’s Transition Assistance Program, for his support to veteran-owned small businesses through use of SBA programs and services. Hey Buddy!, I found this information for you: "SBA honors ‘Atención Atención,’ other entrepreneurs". Here is the website link: https://newsismybusiness.com/honors-atencion-entrepreneurs/. Thank you.